Seamless transition to the cloud. 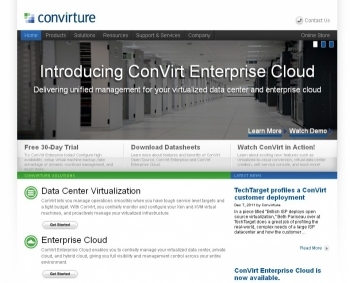 Virtualized-to-cloud conversion. Private and hybrid cloud management. As an IT administrator, you have been eager to take advantage of server virtualization. After all, this technology promises to save costs while enabling you to host more applications with less physical infrastructure and making your datacenter more agile in the face of constantly changing business priorities. However, in reality, you have been faced with two imperfect alternatives: buying virtualization platform and management from a single commercial vendor or going with open source virtualization platforms and doing the management yourself. The former results in high costs and vendor lock-in, while the latter puts a huge amount of management overhead on your staff. Neither choice delivers the cost-effectiveness and flexibility that you need. Now, enter cloud computing, promising to help IT organizations become more efficient and deliver new business services with unprecedented speed. You are eager to take advantage of this new operations model, but are anxious about the impact it will have on your existing operations. Unfortunately, most of the cloud solutions on the market take a rip-and-replace approach, requiring you to separate the infrastructure used to deliver cloud services from the rest of the virtualized environment. This rigid model results in infrastructure and management silos, preventing dynamic allocation of compute resources in response to changing business priorities – which was the main value proposition for virtualizing your data center in the first place! 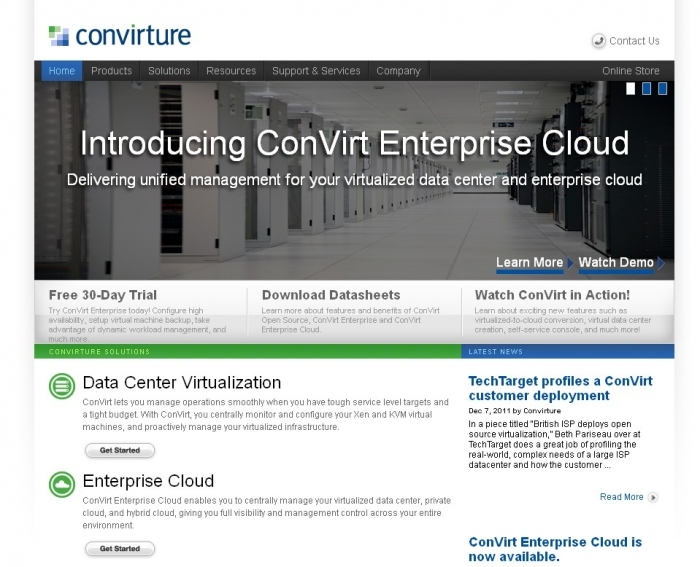 ConVirt has been designed to meet your needs, whether you are just going through a physical-to-virtual conversion, are running a large-scale virtualized datacenter, or are ready to introduce the cloud operations model into your environment. By providing enterprise-grade management of open platforms, such as Xen and KVM, ConVirt enables you to build out your virtualized data center in the most flexible and cost effective way. By managing traditional virtualized workloads side-by-side with cloud operations, ConVirt ensures that you get a holistic view of your entire datacenter and can quickly react to changing business priorities.